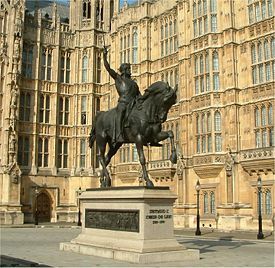 Richard I (September 8, 1157 – April 6, 1199) was king of England from 1189 to 1199. In his own time, the troubadour Bertran de Born called him Oc-e-Non (Yes-and-No), while some later writers referred to him as Richard the Lionheart, Cœur de Lion, as he is still known in France. Although king of England, he was more French than English, and spent little time in his kingdom where he left his brother John in charge. John’s reputation contrasted with Richard’s significantly. Richard was regarded as an accomplished and brave soldier, John as unskilled. Richard, probably because he went off and fought in the Third Crusade and was not in England often, is remembered as a good man while John, known as "Lackland" emerges in myth as a “bad man.” Richard became an iconic figure. Howarth (1982) describes him as, “tall, strong and handsome, with red-gold hair; he was extremely energetic, an excellent horseman and swordsman; he was quick-tempered, but easily calmed ... a first class leader in battle; a gallant with women and a fair poet in court. He was the incarnation of his age” (161). Although, during the Crusades, Saladin, Sultan of Egypt, was his enemy, he negotiated a peace-treaty with him and the two kings developed mutual respect, even friendship—which has itself passed into legend. At a time when many Christians saw Muslims as almost sub-human and when many rejected the possibility of entering any peace treaties or negotiations with them, Richard saw his enemies as of equal worth. Although Richard stands guilty of neglecting the welfare of his people, they have credited him with always keeping this in mind. The third of King Henry II's legitimate sons, Richard was never expected to ascend to the throne. He is generally considered to have been the favorite son of his mother, Eleanor of Aquitaine. 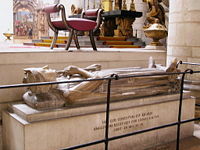 Richard was a younger maternal half-brother of Marie de Champagne and Alix of France. He was a younger brother of William, Count of Poitiers, Henry the Young King and Matilda of England. He was also an older brother of Geoffrey II, Duke of Brittany, Leonora of England, Joan of England, Queen of Sicily and John Lackland of England. As well as being an educated man, able to compose poetry in French and Occitan, he was also very attractive; his hair between red and blond, blue-eyed, his height estimated at six feet, four inches (1.93 meters) tall. He gloried in military activity. From an early age he appeared to have significant political and military abilities, became noted for his chivalry and courage, and soon was able to control the unruly nobles of his territory. Like his brothers, Richard had limited respect for his father and lacked foresight and a sense of responsibility. 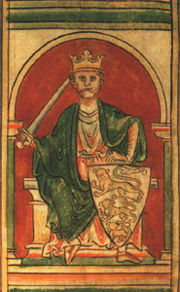 In 1170 his elder brother Henry was crowned king of England as Henry III. Historians know him as Henry "the Young King" so as not to confuse him with the later king of this name who was his nephew. In 1173 Richard joined his brothers, Henry and Geoffrey, Duke of Brittany, in a revolt against their father. They were planning to dethrone their father and leave the Young King as the only king of England. Henry II invaded Aquitaine twice. At the age of 17, Richard was the last of the brothers to hold out against Henry; though, in the end, he refused to fight him face to face and humbly begged his pardon. In 1174, after the end of the failed revolt, Richard gave a new oath of subservience to his father. Richard had several major reasons for discontent with his father. First was Henry's refusal to allow Richard any real power or funds despite pleas by Richard for more of both. Though placated by titles such as Count of Poitou, Richard wanted more and Henry seemed unwilling to entrust any of his sons with resources that could be used against him, with very good reason. Secondly, Henry had appropriated Alys, Countess of the Vexin Richard's betrothed, the daughter of Louis VII of France by his second wife, as his mistress. This made a marriage between Richard and Alys technically impossible–at least in the eyes of the church, but Henry, not wishing to cause a diplomatic incident, prevaricated and did not confess to his misdeed. As for Richard, he was discouraged from renouncing Alys because she was the sister of King Philip II of France, a close ally. After his failure to overthrow his father, Richard concentrated on putting down internal revolts by the dissatisfied nobles of Aquitaine, especially the territory of Gascony. The increasing cruelty of his reign led to a major revolt of Gascony in 1179. Richard had a terrible reputation, including reports of various rapes and murders. The rebels hoped to dethrone Richard and asked his brothers Henry and Geoffrey to help them succeed. A turning point in the rebellion against Richard occurred in the Charente Valley in spring 1179. The fortress of Taillebourg, located in the Charente Valley, was extremely well defended and completely disregarded by previous rulers of Aquitaine because it was considered impregnable. The castle was surrounded by a cliff on three sides and a town on the fourth side with a three-layer wall. Richard first destroyed and looted the farms and lands surrounding the fortress, leaving its defenders no reinforcements or outs. The inhabitants of the Taillebourg fortress were so afraid of Richard at this point, that they left the safety of their castle and attacked Richard outside its walls. Richard was able to subdue the army and then followed the defenders inside the open gates, where Richard easily took over the castle in two days. Richard’s victory at Taillebourg was important for two reasons. First, many barons thinking of rebelling against Richard quickly abandoned those plans and declared their loyalty to Richard. Second, Richard gained a reputation as a skilled military commander, which would follow him throughout the rest of his life. After Richard subdued his rebellious barons, he again challenged his father, Henry II, for the throne. From 1180 to 1183 the tension between Henry and Richard grew, as King Henry commanded Richard to pay homage to Henry the Young King, the heir the English crown, but Richard refused. Finally, in 1183, Henry the Young King and Geoffrey, Duke of Brittany, invaded Aquitaine in an attempt to subdue Richard. Richard’s barons joined in the fray turned against their Duke. However, Richard and his army were able to hold back the invading armies and cruelly executed any prisoners. The conflict took a brief pause in June of 1183 when Prince Henry died. However, Henry II soon gave John Lackland permission to invade Aquitaine in replacement of the dead Prince Henry. When Geoffrey died suddenly in 1186, this left Richard the eldest son and heir to the English crown, but still the fighting between Richard and Henry II continued. In 1188 Henry II planned to concede Aquitaine to his youngest son John Lackland, later King John of England. To strengthen his position, Richard allied himself with Philip II, who was the son of Eleanor's ex-husband, Louis VII, by his third wife, Adele of Champagne. In exchange for Philip's help against his father, Richard promised to concede his rights to both Normandy and Anjou to Philip. Richard gave an oath of subservience to Philip in November of the same year. In 1189 Richard attempted to take the throne of England for himself by joining Philip's expedition against his father. On July 4, 1189, Richard and Philip II’s forces defeated the forces of Henry II at Ballans. Henry, with John's consent, agreed to name Richard his heir. On July 6, 1189, Henry II died in Chinon, and Richard I succeeded him as King of England, Duke of Normandy, and Count of Anjou. He was officially crowned duke on July 20 and king in Westminster on September 3, 1189. When Richard was crowned king of England, he barred all Jews and women from the ceremony (this was apparently a concession to the fact that his coronation was not merely one of a king but of a crusader), but some Jewish leaders showed up anyway to present gifts for the new king. According to Ralph of Diceto, Richard's courtiers stripped and flogged the Jews, then flung them out of court. When a rumor spread that Richard had ordered all Jews to be killed, the people of London joined in to persecute the Jews, and a massacre began. Many Jews were beaten to death, robbed, and burnt alive. Many Jewish homes were burned down and several Jews were forcibly baptized. Some sought sanctuary in the Tower of London, and others managed to escape. Among those killed was Jacob of Orléans, widely regarded as one of the most learned of the age. However, other chroniclers such as Benedict of Peterborough tell a different story, saying the rioting was started by the jealous and bigoted citizens of London. Richard is said to have punished the perpetrators and allowed a forcibly converted Jew to return to Judaism. Archbishop of Canterbury Baldwin of Exeter reacted by remarking, "If the King is not God's man, he had better be the devil's," a reference to the supposedly infernal blood in the Angevin line. In either case, realizing that the assaults could destabilize his realm at the time of his imminent departure for the Holy Land, Richard ordered the execution of those responsible for the most egregious murders and persecutions (most of those who were hanged were the rioters who had accidentally burnt down Christian homes). Further, he distributed a royal writ demanding that the Jews be left alone. However, the edict was loosely enforced, as the following March there was a renewed outbreak of violence, including a massacre at York. Richard has been criticized for doing little for England, siphoning the kingdom's resources to support his Third Crusade and campaigns in what is now France. He spent only six months of his reign in England, claiming it was "cold and always raining." During the period when he was raising funds for his Crusade, Richard was heard to declare, "If I could have found a buyer I would have sold London itself." However, England was a minor part of his territories, only important in that it gave him a royal title with which to approach other kings as an equal. Like most of the Plantagenet kings before the fourteenth century, he had no need to learn the English language. Leaving the country in the hands of various officials he designated (including his mother, at times), Richard was far more concerned with his French possessions (which were much larger than England). His father Henry II of England and Philip II of France had already taken the cross at Gisors on January 21, 1188, inspired by the loss of Jerusalem to the Muslims under the command of Saladin. Richard, too, had done so as Count of Poitou. Having become king, he and Philip agreed to go together, since each feared that, during his absence, the other might usurp his territories. Richard swore an oath to renounce his past wickedness in order to show himself worthy to take the cross. He started to raise a new English crusader army, though most of his warriors were Normans, and supplied it with weapons. He spent most of his father's treasury (filled with money raised by the Saladin tithe), raised taxes, and even agreed to free King William I of Scotland from his oath of subservience to Richard in exchange for 10,000 marks. To raise even more money he sold official positions, rights, and lands to those interested in them. Even those already appointed were forced to pay exorbitant sums to retain their posts. Even William Longchamp, Bishop of Ely and the king's chancellor, made a show of bidding £3,000 to remain as chancellor. He was apparently outbid by a man named Reginald the Italian, but his bid was refused. He finally succeeded in raising a huge army and navy. After repositioning the part of his army he left behind to guard his French possessions, Richard finally started his expedition to the Holy Land in 1190. He appointed as regents Hugh, Bishop of Durham, and William de Mandeville, 3rd Earl of Essex, who soon died and was replaced by Richard's chancellor, William Longchamp. Richard's brother John I was not satisfied by this decision and started scheming against William. Joan was to be released, receiving her inheritance along with the dowry her father had given to the deceased William. Richard and Philip recognized Tancred as legal King of Sicily and vowed to keep the peace between all three of their kingdoms. Richard officially proclaimed his nephew, the son of Geoffrey, Arthur of Brittany, as his heir, and Tancred promised to later marry one of his daughters to Arthur when he came of age (Arthur was only four years old at the time). Richard and Tancred exchanged gifts as was customary; Richard gave Tancred a sword claimed to be Excalibur, the enchanted blade of King Arthur. After signing the treaty Richard and Philip left Sicily. The treaty undermined England's relationships with the Holy Roman Empire and caused the revolt of Richard's brother John, who hoped to be proclaimed heir instead of their nephew. Although his revolt failed, John continued to scheme against his brother after this point. In April 1191, while en route to the Third Crusade, Richard stopped on the Byzantine island of Rhodes to avoid the stormy weather. It seems that Richard had previously met his fiancée Berengaria of Navarre only once, years before their wedding. He had assigned his mother to represent him and convince her father, Sancho VI of Navarre, and her other relatives to agree to the wedding, and to bring the bride to the wedding. Richard came to their rescue when they were shipwrecked on the coast of Cyprus. He left Rhodes in May but a new storm drove Richard's fleet to the island. On May 6, 1191, Richard's fleet arrived in the port of Lemesos (now Limassol). Richard captured the city easily with his massive army. When the island's despot, Isaac Comnenus of Cyprus, arrived to stop the crusaders he discovered he was too late and retired to Kolossi. Richard called Isaac to negotiationsm but Isaac broke his oath of hospitality and started demanding Richard's departure. Richard ordered his cavalry to follow him in a battle against Isaac's army in Tremetusia. The few Roman Catholics of the island joined Richard's army and so did the island's nobles who were dissatisfied with Isaac's seven years of tyrannical rule. Though Isaac and his men fought bravely, Richard's army was bigger and better equipped, assuring his victory. Isaac continued to resist from the castles of Pentadactylos, but after the siege of his castle of Kantara he finally surrendered. In a fit of sardonic irony, once Isaac had been captured Richard had him confined with silver chains, scrupulously abiding by a previous promise that he would not place Isaac in irons should he be taken prisoner. Richard became the new ruler of Cyprus, gaining for the Crusade a major supply base that was not under immediate threat from the Saracens. Richard looted the island and massacred those trying to resist him. He and most of his army left Cyprus for the Holy Land early in June. In his absence, Cyprus was to be governed by Richard Camville. Before leaving Cyprus, Richard married Berengaria, first-born daughter of King Sancho VI of Navarre. The wedding was held in Limassol on May 12, 1191, at the Chapel of St. George. It was attended by his sister Joan, whom Richard had brought from Sicily. It should be noted that when Richard married Berengaria, he was still officially betrothed to Alys and that Richard pushed for the match in order to obtain Navarre as a fief like Aquitaine for his father. Further, Eleanor championed the match, as Navarre bordered on Aquitaine, thereby securing her ancestral lands' borders to the south. Richard took his new wife with him briefly on this episode of the crusade. However, they returned separately. Berengaria had almost as much difficulty in making the journey home as her husband did, and did not see England until after his death. Although after his release from German captivity, Richard showed some degree of regret for his earlier conduct, he was not joined by his wife. The fact that the marriage was childless is inconclusive, but Richard had to be ordered by a priest to reunite with and to show fidelity to Berengaria in the future, with the language he used (referring to "the sin of Sodom") being strong evidence that Richard was homosexual. Some modern writers have alleged that Berengaria's own brother Sancho (the future Sancho VII) was one of Richard's early lovers; others have tried to link him with Philip of France. Nevertheless, when he died in 1199, Berengaria was greatly distressed, apparently having loved her husband very much. In Cyprus, Richard had received military support from Guy of Lusignan, widower of Richard's father's first cousin Sibylla of Jerusalem. Guy was still attempting to retain his title as king of Jerusalem, despite his wife's death during the siege of Acre the previous year and was hoping for Richard's backing, since his family was the vassals of Richard in Poitou. His rival for the throne was Conrad of Montferrat, second husband of Sibylla's half-sister, Isabella of Jerusale: Conrad, whose defense of Tyre had saved the kingdom in 1187, was supported by Philip of France, son of his first cousin Louis VII of France, and by another cousin, Duke Leopold V of Austria. Richard also allied with Humphrey IV of Toron, Isabella's first husband, from whom she had been forcibly divorced in 1190. Humphrey was loyal to Guy, and spoke Arabic fluently, so Richard used him as his translator and negotiator. King Richard arrived at `Akko in June 1191, where he and his forces carried out a successful capture of the city. At one point, while sick from scurvy, Richard himself was carried on a stretcher and picked off guards on the walls with a crossbow. Eventually, Conrad of Montferrat concluded the surrender negotiations with Saladin, and raised the banners of the kings in the city. Richard quarreled with Leopold V of Austria over both the deposition of his relative, Isaac Comnenus, and Leopold's position within the Crusade. This came to a head when he ordered his men to raise the Austrian banner alongside the English and French standards. This was interpreted as rank arrogance by both Richard and Philip, as Leopold was a dependent vassal of the Holy Roman Emperor. Richard's men, with or without his knowledge, tore the flag down from its pole and threw it in the moat of the Acre fortifications. Leopold, stung bitterly by the act, left the Crusade immediately. Finally, Philip also left the Crusade, in poor health and after heated negotiations with Richard over the status of Cyprus (Philip demanded half the island) and the kingship of Jerusalem. Richard suddenly found himself without allies. Richard had kept 2,600 Muslim prisoners as hostages against Saladin fulfilling all the terms of the surrender of the lands around Acre. Philip, before leaving, had entrusted his own prisoners to Conrad, but Richard had forced him to hand them over to him. Richard feared his forces being bottled up in Acre, as he believed his campaign could not advance with the prisoners in train. In a fit of impatience, he ordered all the prisoners killed. An election forced Richard reluctantly to accept Conrad of Montferrat as King of Jerusalem, and he sold Cyprus to his own protégé, Guy of Lusignan. However, only days later, on April 28, 1192, Conrad was stabbed to death by assassins before he could be crowned. Eight days later, Richard's own nephew, Henry II of Champagne was married to the widowed Isabella of Jerusalem, although she was carrying Conrad's child. The murder has never been conclusively solved, and Richard was widely suspected of involvement. Richard's tactics had ensured success at the siege of Acre and on the subsequent march south, Saladin's men being unable to harass the Crusader army into an impulsive action which might not have gone their way. However, the desertion of the French king had been a major blow, from which they could not hope to recover. Realizing that he had no hope of holding Jerusalem even if he took it, Richard sadly ordered a retreat. Despite being only a few miles from the city, he refused, thereafter, to set eyes on it, as he had vowed to look upon it only once he had conquered the city. After the retreat from Jerusalem, there commenced a period of minor skirmishes with Saladin's forces while Richard and Saladin negotiated a settlement to the conflict, as both realized that their respective positions were growing untenable. On Richard's side, he knew that both Phillip and his own brother John were starting to plot against him. However, Saladin held firm on the razing of the fortifications of Ascalon (which Richard's men had rebuilt) and a few other points. Richard tried one last-ditch attempt to raise his bargaining position by attempting to invade Egypt—a major source of resupply for Saladin—but failed. In the end, time ran out for Richard. He had finally realized that his return home could be postponed no longer, since both Philip and John were taking advantage of his absence to make themselves more powerful. He and Saladin finally came to a settlement of the conflict on September 2, 1192—this included the provisions demanding the destruction of Ascalon's wall as well as an agreement allowing Christian access to and presence in Jerusalem. It also included a three-year truce. This enabled the remaining Crusader states to survive for another hundred years, until Castle Pilgrim, the last Frankish outpost in Outremer fell on August 14, 1291. Bad weather forced Richard's ship to put in at Corfu, the territory of the Byzantine Emperor Isaac Angelus, who was still angry at Richard for his annexation of Cyprus. Disguised as a Knight Templar, Richard sailed from Corfu with four attendants in a pirate ship, which wrecked near Aquileia, forcing Richard and his party into a dangerous land route through central Europe. On his way to the territory of Henry of Saxony, his brother-in-law, Richard was captured shortly before Christmas 1192, only a few miles from the Moravian border, near Vienna, by Leopold V of Austria, who accused Richard of ordering the death of Conrad, who was his first cousin. Richard and his retainers had been traveling disguised as pilgrims. Richard himself was dressed like a kitchen hand, but was identified because he was wearing a magnificent and costly ring no menial worker could afford (another tale claimed he was identified by his insistence on eating roast chicken, a great delicacy reserved for nobility). The Duke handed him over as a prisoner to Henry VI, Holy Roman Emperor, after being held captive at Dürnstein. It was here that he wrote Ja nus hons pris or Ja nuls om pres, a song in French and Occitan versions, expressing his feelings of abandonment by his people. Although the conditions of his captivity were not severe, he was frustrated by his inability to travel freely. Richard once proudly declared, "I am born of a rank which recognizes no superior but God" to the emperor. His mother, Eleanor of Aquitaine, worked tirelessly to raise the ransom of 150,000 marks demanded by the German emperor, which was twice the annual income for the English Crown. Both clergy and laymen were taxed for a quarter of the value of their property, the gold and silver treasures of the churches were confiscated, and money was raised from the scutage and the carucage taxes. The emperor demanded that 100,000 marks be delivered to him before he would release the king, the same amount that had been raised by the Saladin tithe only a few years earlier. At the same time, John, Richard's brother, and King Philip offered 80,000 marks for the emperor to hold Richard prisoner until Michaelmas 1194. The emperor turned down the offer. The money to rescue the king was transferred to Germany by the emperor's ambassadors, but "at the king's peril" (had it been lost along the way, Richard would have been held responsible), and finally, on February 4, 1194, Richard was released. King Philip of France sent a message to John of England: "Look to yourself; the devil is loose." During his absence, John had come close to seizing the throne; Richard forgave him, and even named him as his heir in place of Arthur, who was growing into an unpleasant youth. Instead of turning against John, Richard came into conflict with his former ally and friend, King Philip. When Philip attacked Richard's fortress, Chateau-Gaillard, he boasted, "if its walls were iron, yet would I take it," to which Richard replied, "If these walls were butter, yet would I hold them!" Determined to resist Philip's designs on contested Angevin lands such as the Vexin and Berry, Richard poured all his military expertise and vast resources into war on the French king. He constructed a grand alliance of powers against Philip, including Baldwin IX of Flanders, Renaud, Count of Boulogne, and his father-in-law King Sancho of Navarre, who raided Philp's lands from the south. Most importantly, he managed to secure the vast Welf inheritance in Saxony for his nephew, Henry the Lion's son Otto of Poitou; Otto's position became so strong that he was to be elected as Otto IV of Germany. Partly as a result of these and other intrigues, Richard won several victories over Philip, and only chance was to rob them of conclusive value. At the battle of Gisors Richard I took Dieu et mon Droit ("God and my Right") as his motto, reinforcing his earlier boast to the Emperor Henry that his rank acknowledged no superior but God. At the skirmish of Freteval, Philip fled ignominiously in panic, leaving his entire archive of financial audits and documents to be captured by Richard. In the end it was not the armies of Philip, but a minor siege of the rebellious castle of Châlus-Charbrol in Limousin, France, on March 26, 1199, that would take Richard's life. The siege was an example of the untamable rebellions of Aquitaine that Richard had contended with all his life; some chroniclers claim Richard had heard of a treasure trove, golden statues of a king and his retainers, at Châlus, but this is generally thought to be apocryphal. Pierre Basile was probably one of only two knights defending Châlus. Richard, who had removed some of his chain mail, was wounded in the shoulder by a crossbow bolt launched from a tower by Basile, as the King laughed at the man's ingenuity in using a frying-pan as a shield. Gangrene set in and Richard asked to see his killer. He ordered that Basile be set free and awarded a sum of money. 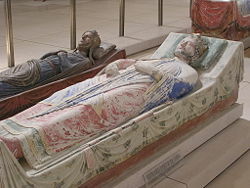 However as soon as Richard died, with his 77-year-old mother Eleanor at his side, on April 6, 1199. Richard's most infamous mercenary captain, Mercadier, had Basile flayed alive and then hanged. Richard's bowels were buried at the foot of the tower from which the shot was loosed; his heart was buried at Rouen, while the rest of his remains were buried next to his father at Fontevraud Abbey near Chinon and Saumur, France. Richard produced no legitimate heirs, although he is purported to have had one illegitimate son. As a result, he was succeeded by his brother John as king of England. However, his French territories initially rejected John as a successor, preferring his nephew Arthur of Brittany, the son of their late brother Geoffrey, Duke of Brittany, whose claim was technically better than John's. Significantly, the lack of any direct heirs from Richard was the first step in the dissolution of the Angevin Empire. While kings of England continued to press claims to properties on the continent, they would never again command the territories Richard I inherited. His achievement in Outremer was also significant. Setting aside the issue of whether the Crusades were moral or immoral, he secured the survival of the last outposts of European presence for another hundred years. While the Crusades are usually depicted as a blot on the Christian record and as contributing to ongoing Christian-Muslim animosity, the reality was more complex. Once settled Outremer, many Crusaders realized that they could only survive by entering peace treaties with the Muslims. From a Muslim perspective, the Muslim world at that time was divided into rival Sultanates, thus the Christian presence, conveniently located between the two main camps, Egypt and Damascus, provided a useful buffer, at least temporarily. Richard, unlike many Christian leaders, treated the enemy with respect, and as equally human. Richard's legacy comprised several parts. First, he captured Cyprus, which proved immensely valuable in keeping the Frankish kingdoms in the Holy Land viable for another century. Secondly, his absence from the English political landscape meant that the highly efficient government created by his father was allowed to entrench itself, though King John would later abuse it to the breaking point. The last part of Richard's legacy was romantic and literary. No matter the facts of his reign, he left an indelible imprint on the imagination extending to the present, in large part because of his military exploits. This is reflected in Steven Runciman's final verdict of Richard I: "he was a bad son, a bad husband and a bad king, but a gallant and splendid soldier" (1951, V3, 75). Gillingham (1978) offers a somewhat different assessment, arguing that judged by twelth century standards, Richard was in reality a masterful and businesslike ruler. By the 1260s, a legend had developed that, after Richard's capture, his minstrel, Blondel, traveled Europe from castle to castle, loudly singing a song known only to the two of them. Eventually, the story goes, he came to the place where Richard was being held, and heard the song answered with the appropriate refrain, thus revealing where the king was incarcerated. The story was the subject of André Ernest Modeste Grétry's opera Richard Coeur-de-Lion (1784). It seems unconnected to the real Jean 'Blondel' de Nesle, an aristocratic trouvère. In the sixteenth century, a few fictionalized chronicles linked Richard with the Robin Hood legends, although this did not become widespread until Walter Scott's Ivanhoe, and has subsequently been popularized by cinema. These later Hood stories depict Robin as upholding justice in Richard's name, against John and his officials, during Richard's imprisonment. However, in the earliest Robin Hood ballads the only king mentioned is "Edward our comely king", most probably Edward II or III. In the Arabic world, Richard became a bit of a bogeyman for centuries after his death. Mothers would occasionally threaten unruly children with the admonition "King Richard will get you" well into the late nineteenth century. This can be understood, however, as a tribute to Richard's skills and “daring exploits,” as does the following: “when any horse belonging to a Saracen shied at a bush its master would say to it, ‘D'you think that's King Richard of England?’” (Fletcher, 90). Richard has appeared frequently in fiction, as a result of the 'chivalric revival' of the Romantic era. Sir Walter Scott depicts him in Ivanhoe, in which he initially adopts the pseudonym of Le Noir Fainéant ("The Black Sluggard"), and in The Talisman (1825), a highly fictionalized treatment of the Third Crusade. He is also a major character in James Goldman's play The Lion in Winter, which depicts him as homosexual. He features in Graham Shelby's The Kings of Vain Intent and, more centrally, in The Devil is Loose, Norah Lofts' The Lute-Player, and Jean Plaidy (Eleanor Hibbert)'s The Heart of the Lion. He is generally portrayed in a heroic role in children's fiction, such as Ronald Welch's Knight Crusader. William of Tyre, French continuation of Historia rerum in partibus transmarinis gestarum. (External link to text in mediæval French). Williams, Patrick A. "The Assassination of Conrad of Montferrat: Another Suspect? ", Traditio XXVI, 1970. All links retrieved July 11, 2015. History of "Richard I of England"
This page was last modified on 11 July 2015, at 22:36.